– We [Syrian soldiers] first thought the aircraft are support to us after the first 2 shots, but we quickly found out that they are targeting our forces aggressively, while we were fighting IS terrorists. The aircraft used cluster bombs against us. – The US air-strikes destroyed all our equipment and defense points. – It for sure wasn’t a mistake, they targeted us intentionally to help IS. And then they tell us (i.e. the Western media) that the Islamic State is threatening the Western World, that ISIS-Daesh cells are responsible for the terror attacks in Europe and the US. Nonsense! Washington and its allies are the State Sponsors of Terrorism. The various jihadist organizations including ISIS-Daesh and al Nusra are supported and funded by the Western military alliance. 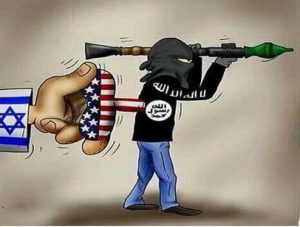 The weekend bombings in New York and New Jersey have served to distract public attention from the fact (amply documented) that US forces in Syria are protecting the ISIS-Daesh terrorists. ”put these attacks [New York, New Jersey, Minnesota] in the context of the military campaign in Syria and Iraq against the Islamic State, also known as ISIS or ISIL”. Nonsense. These events have nothing to do with the military campaign in Syria. The USA is supporting the Islamic State. “We’re going to take out their leaders; we’re going to take out their infrastructure,… As we take away more of their territory, it exposes ISIL as the failed cause it is.”, said Obama. Obama: You are the failed cause, because you are the ISIL. Your administration embodies terrorism. Political lies are sustained by media disinformation and war propaganda. The US is supporting the Islamic State. The ISIS rebels are the foot-soldiers of the Western military alliance.